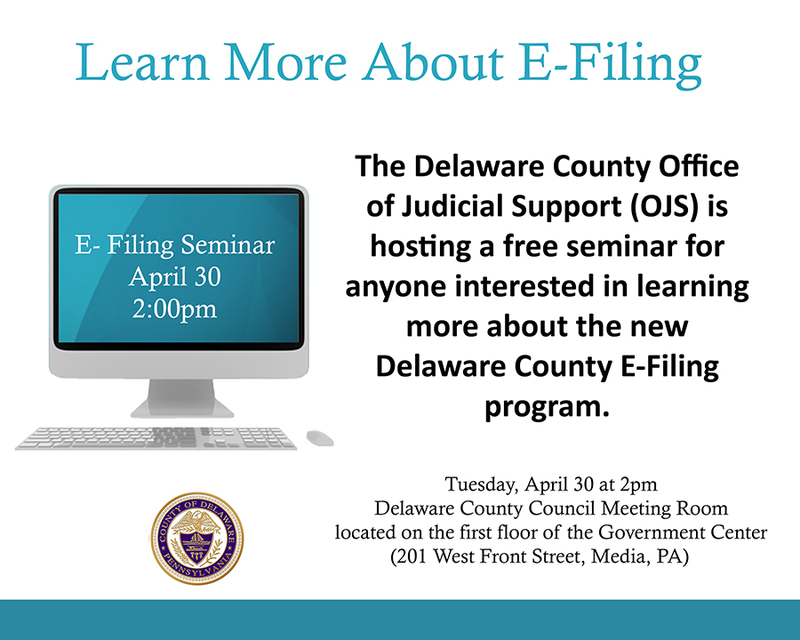 The Delaware County Office of Judicial Support will be hosting a free program for anyone interested in learning more about the new Delaware County E-filing program. The program will be held on Tuesday, April 30 at 2:00p.m. in the Delaware County Council Meeting Room, First Floor, Government Center (201 West Front Street, Media, PA.) Anyone is welcome to attend; pre-registration is not necessary. The program will include a demonstration on how to register for E-filing, how the program runs, the benefits of E-filing and a question and answer session. The E-filing program is available to anyone without a fee to register. On October 29, 2018, the E-filing program became mandatory for civil filers. E-filing is not currently available for Family Law cases (Divorce, Custody or Annulment), but will become available for Family Law by the end of 2019.